The International Organization for Migration (IOM) Deputy Director General, Laura Thompson and François and Pascal Briod, TawiPay CEO and Head of Product, respectively, yesterday signed a Memorandum of Understanding, launching a public-private partnership to contribute to the lowering of remittances transaction costs globally and to the monitoring of Sustainable Development Goals (SDG) target 10.c. TawiPay aims to provide migrants with real-time data on remittances transfer costs for any sent amount and to build a global remittances data observatory allowing the monitoring of the actual costs of sending remittances worldwide. IOM has made the lowering of remittances transfer costs one of its priorities within its migrant-based approach to remittances. 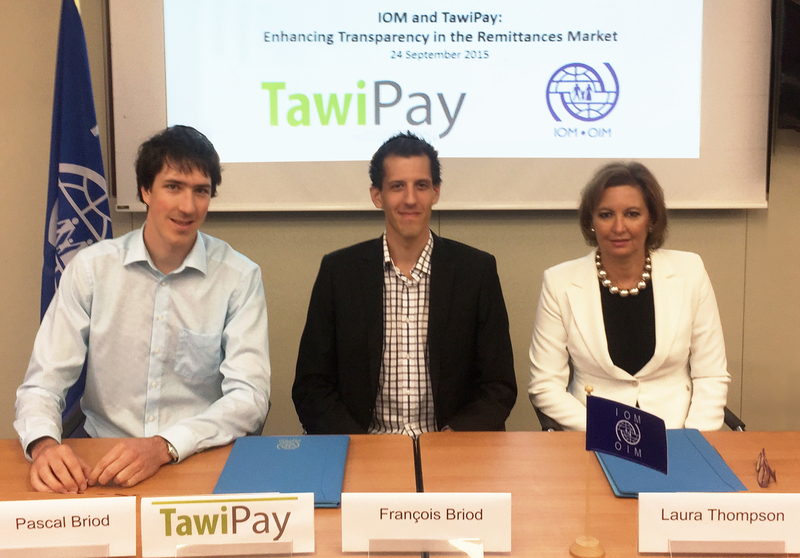 This partnership builds on the mutual complementarity of IOM and TawiPay to provide migrants with reliable information on remittances transfer costs. It will also provide a very useful tool to monitor SDG target 10.c, which aims, by 2030, to reduce to less than 3 per cent, the transaction costs of migrant remittances and eliminate remittance corridors with costs higher than 5 per cent. “This partnership represents what we want to promote as public-private partnership: an alliance that builds on the complementarities of public and private actors and that benefits migrants in the first place,” said Ambassador Laura Thompson. “Migrants work hard to send money back home to their relatives, but face hefty charges. What is needed is information that is not only reliable and up-to-date, but also readily accessible, both for migrants and institutions working to lower the cost of remittances. This partnership is a step forward in our mission to bring transparency and more competition to the remittances market,” said François Briod, CEO of TawiPay.